DESIGN: The Turismo Veloce stands out immediately as an MV Agusta, despite the fact that it expresses a stylistic concept which is uncommon for the brand from Schiranna. The overall compact sensation provided by the size of the three-cylinder engine, further reduced by the hydraulic clutch control, is expressed in extremely well balanced volumes on the two axles, even with the side panniers mounted. This accessory was actually the cornerstone of the Turismo Veloce's overall design on which a slim, sleek and exclusive bike was built, but also functional and innovative. 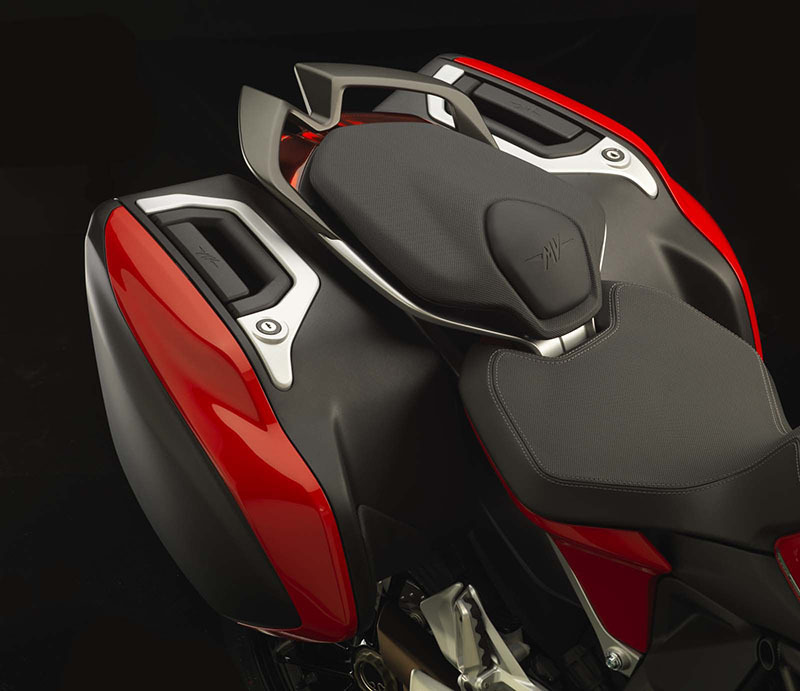 With a 30 liter capacity each, they integrate perfectly and smoothly with the bike thanks to a special saddle mounting frame on the two sides with built-in passenger hand grips. Besides the aesthetics, these side panniers (color coded to match the body) have a regular volume that accommodates a flip up helmet and they have two indentations where the legs can rest comfortable. Even the fuel tank, particularly narrow in the area that comes into contact with the knees, demonstrates an evolution both in terms of style and capacity (22 liters), conveying a general feeling of three dimensionality also emphasized by the design of the Full LED light clusters and the new three-muffler exhaust layout, which are now quadrangular. 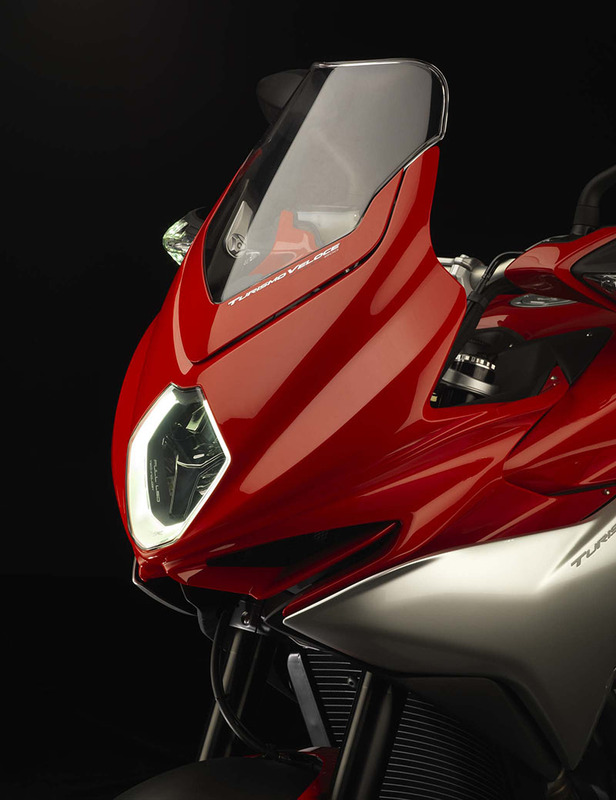 The semi-fairing, with a clean and tidy design, joins the tank to the top fairing which has an adjustable windshield (up to 60 mm). Inside it space for two glove-boxes was found which snap closed, whereas the hand guards have built-in turn indicators. The two saddle portions are particularly refined and comfortable, with the passenger seating area perforated and sporting exposed stitching. The lightweight alloy wheels are also brand new and the rear has a 6 in. channel. FRAME AND SUSPENSION: The frame is unmistakably MV Agusta - steel tubing at the front set off by aluminum alloy side plates - redesigned to meet the specific requirements of the Turismo Veloce. As a result, it is wider in the middle section and features special plates designed to act as an anchor for the center stand. 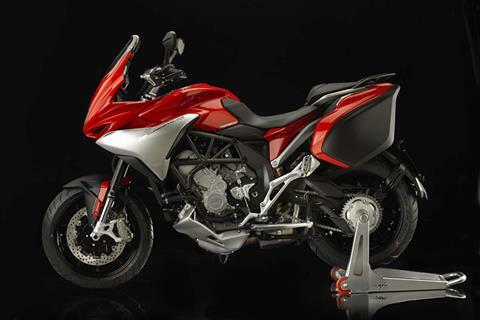 The Turismo Veloce makes good use of the rider and passenger saddle support as well as the saddle bags thanks to a lightweight aluminum alloy support system. 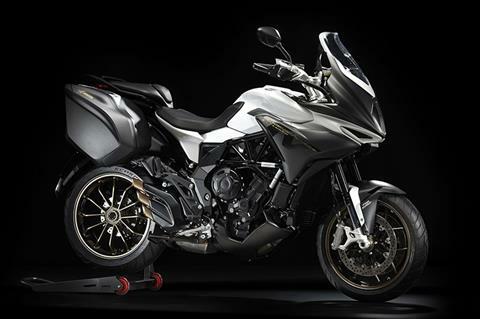 The suspension system has been developed to ensure maximum comfort when touring and dynamic performance in sports use. 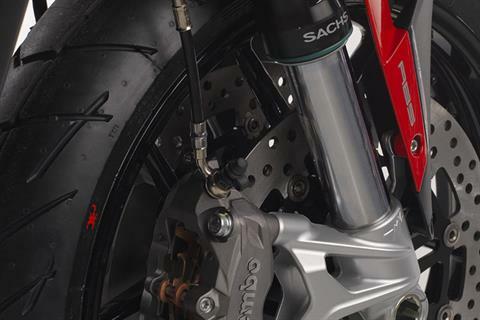 On the Turismo Veloce Lusso, the MVCSC 2.0 system, employing Sachs front forks and rear shock absorber, features a sophisticated electronic control system which provides the best possible response to all specific riding conditions by continuously monitoring and changing the hydraulic settings. The ECU includes the inertial platform which supplies vital parameter readings key to the continuous suspension setting changes and employs the Skyhook algorithm. 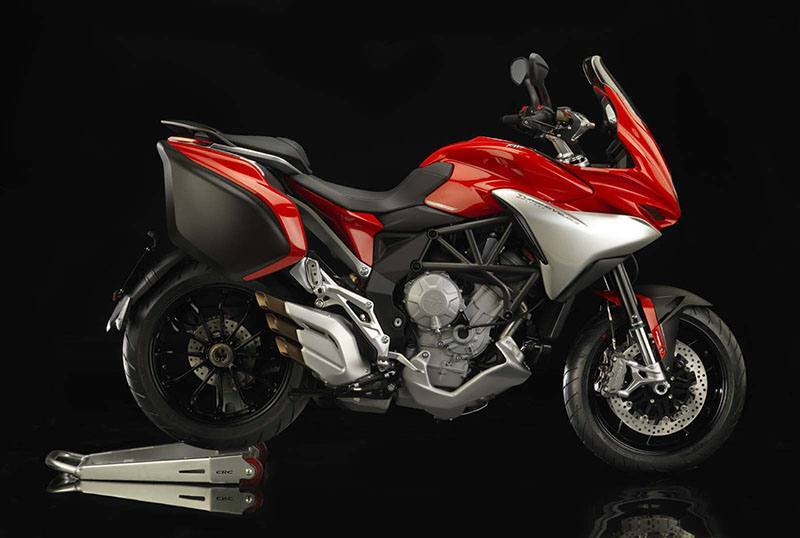 This algorithm was specifically developed by MV Agusta. The system acts on the hydraulic compression and rebound readings when the bike is in motion. ENGINE AND ELECTRONICS: The performance of a heavyweight and the weight of a medium size engine, this is the magic of the 800 cc in line three cylinder engine. In the configuration developed for the Turismo Veloce these parameters shifted from the search for maximum power to the search for the most evenly distributed power curve possible, increasing the maximum torque value 20% compared to the sportier versions, obtaining 2100 rpm less. All this thanks to redesigned and appropriately phased driven cam profiles, a new piston, new dedicated intake and exhaust systems and dedicated mapping strategies developed specifically for this bike, all enhanced by the three cylinder split which, as we all know, theorises the ideal engine with bar setting low and medium speeds, accompanied by a thrilling peak speed. This three-cylinder engine has many characteristics which make it a milestone for MV in terms of the technology applied to a standard production bike. The oil and water cooling systems have been built into the engine casting and this is the particular feature of the three-cylinder engine that gives it such an exceptional aesthetic impact and which allows it to blend in perfectly with the flowing lines of the Turismo Veloce. Under the cast and forged aluminum surfaces lies a counter-rotating crankshaft derived directly from MotoGP. 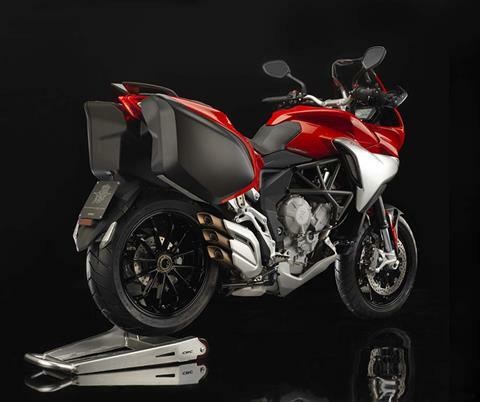 This was introduced as standard on the F3 675 and characterizes the MV Agusta three-cylinder engine, not to mention the considerable impact it has on riding dynamics by significantly deceasing the effects of inertia when the bike changes direction. 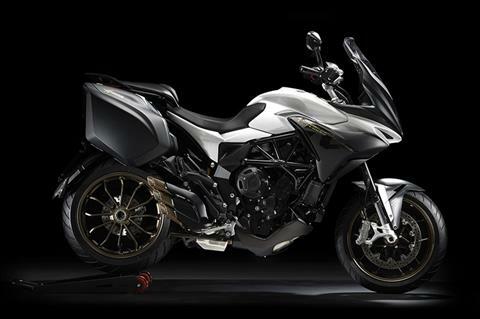 The precise application of fluid dynamic and thermodynamic principles, along with advanced electronic engine management systems have permitted specific fuel mapping settings to be designed which ideally suit both Touring and Sport riding modes on the new Turismo Veloce. Among the new features are the hydraulic timing chain tensioner, common to all the MY2015 three-cylinder engines as well as, like on the Stradale, the hydraulically controlled clutch. However, unlike the Stradale, the Turismo Veloce also boasts the mechanical slipper clutch. All of these evolutions allowed service intervals to be increased, now going from 6000 to 15000 km. Spark plug changes and valve adjustment has even gone to 30000 km. Both the battery and the alternator are more powerful, going from 350 to 450W. The exhaust system is also brand new, with a 400 cell catalytic converter. 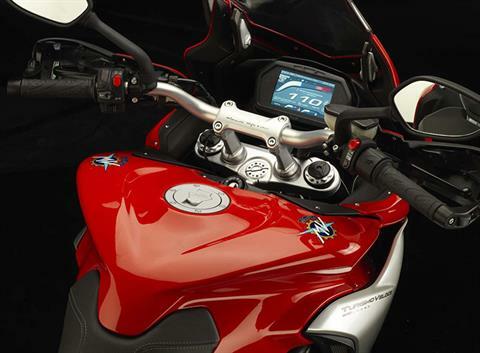 The reference platform is the new second generation MVICS 2.0 (Motor & Vehicle Integrated Control System) which lets the rider customize mapping with versatility being its strongest point. There are three preset mapping options. The Turismo option offers fuel mapping specifically designed for touring and limits power output to 90 HP. The Sport setting increases power to the maximum output of 110 HP whereas the Rain option (80 HP) is for riding safely in poor grip conditions and the Traction Control is automatically set to the maximum level. The fourth option, Custom, is also available so that the rider can select various parameters in order to create the best possible set-up for his or her own personal desires. Some of the parameters that can be customized are the engine torque curve in-line with power output (two levels), rev limiter cut-in point (Hard or Soft), throttle sensitivity (three levels), engine braking (two levels), engine response (two levels) and of course the traction control (eight levels). 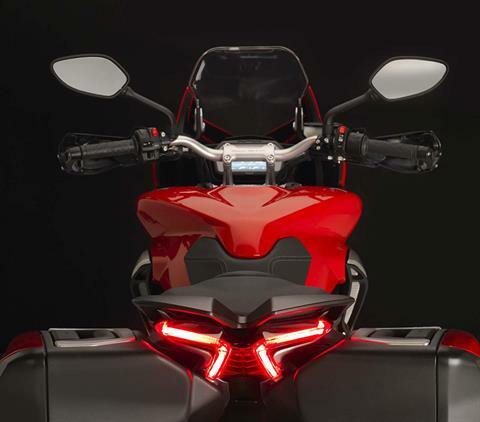 Some of the new features include the handlebar controls, characterized by an even more user-friendly logic which allows them to be used on the fly, without distracting the rider's attention from the road. The rider can access the instrumentation menu by using dedicated buttons in order to make any changes to bike management parameters even quicker. The instrument cluster displays all the Turismo Veloce's most important information and was designed exclusively for this model. Based on a 5" bright and ultra-modern color TFT display (the same technology used for smartphone screens), it provides access to the numerous on board electronics parameters. The instrumentation also displays the fuel level using a progressive graphic and there is a photodiode that switches the lights from DRL to low-beam automatically. With the Lusso package there is also an advanced GPS data acquisition system to characterize the bike from a touring point of view. Data acquisition includes information on the route, fuel consumption and engine use. Thanks to the ergonomic arrangement of the TFT panel, the rider always has a perfect view of the road, even when checking the instrumentation, which is a fundamental safety feature. Last but not least, Turismo Veloce uses Bluetooth technology to keep the rider, passenger and vehicle in constant communication, allowing them to share the riding experience through dedicated apps.